This year for BG’s Srl, manufactured of the Parie Electromagnetic organ, is an important year. The new society group “BG’s Musical Instruments” entered music business market with a lot of news! Hamichord: it is the ultimate tonewheel organ clone in the hardware panorama. It is an exact copy of the original US electromagnetic organ in all the “console” features, from the position of the drawbars, percussion and other things, to the sound; it is capable of merging the “Vintage” world with the more modern side of music, it can be analog and digital in the same time! Crumar: Bg’s Musical Instruments is the new owner of the Crumar Brand. 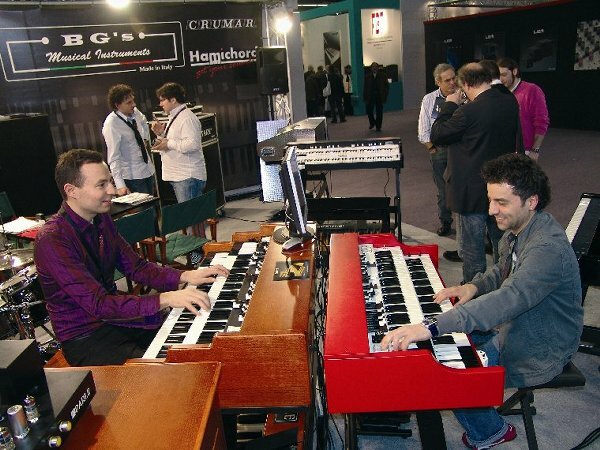 The Original Crumar Musical Instruments factory, located in Castelfidardo, the same city of Bg’s, is well known in the world for superior quality keyboards made from the late 60’ to 1984 year when the production of Crumar ceased. Now Bg’s Musical Instruments would like to make keyboards with same quality in construction and sound like the old original Crumar. The first product presented in the Messe was the “Baby Grand” a digital piano working 100% with phisical modeling technology using the Pianoteq software from Moddart together in a classic enclosure of “Pure Italian Design”. VB3 by GSI software: It’s a new software line totally made in Italy: it is the ultimate simulation of the tonewheels organ with a lot of feature and with a great sound. You can use it with your laptop or your desktop PC, you can use it in your Cubase, or you can put the standalone version in the Hamichord, to upgrade it with this new sound engine. It is the first upgrade for Hamichord: try the upgrading experience by yourself!